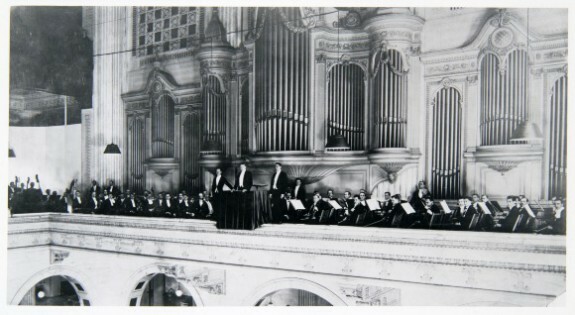 In the 1920’s, Stokowski’s “Philadelphia Sound” was paired with the Great Organ in the Grand Court of the Philadelphia Wanamaker Store. This performance may be evidence of the Philadelphia Orchestra’s attempts both to diversify its choice of venue and to improve its relationship with the people of Philadelphia through local performances outside of the Academy of Music. Stokowski was one of the most successful conductors of the Philadelphia Orchestra, being credited with creating the “Philadelphia Sound” through the introduction of “free bowing,” which created a warmer, more intense and continuous sound. His organization of 950 voices, 110 orchestra players and eight soloists for the American premiere of Mahler’s Eighth Symphony in 1916 would garner international fame, often referred to as the Symphony of a Thousand. 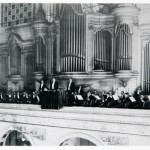 He introduced the idea of children’s concerts in 1921 (the same year this photograph was taken), which would evolve into hugely successful youth concerts by 1933. Stokowski and the orchestra further enhanced the orchestra’s reputation by making recordings, beginning with Brahms’ Hungarian Dances nos. 5 and 6, recorded on October 24, 1917 in the eighteenth-floor auditorium of the Victor Talking Machine Company’s Office Building No. 2 in Camden. 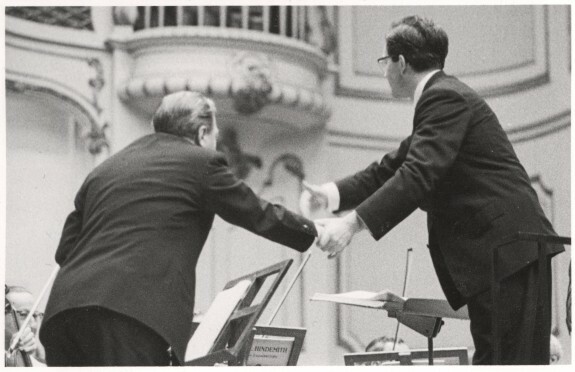 Similar collaborations with Victor and, later, RCA, continued for more than thirty years and further enhanced the reputation of the orchestra and its unique sound. Stokowski would also inspire Walt Disney’s animated film Fantasia, which featured recordings of the Philadelphia Orchestra. The musicians’ many travels with Ormandy included a 1949 tour of Great Britain in which they played twenty-eight concerts in twenty-seven days. It was the first time an American orchestra had crossed the Atlantic since Toscanini and the New York Philharmonic traveled to Europe in 1930. The Philadelphia Orchestra first toured continental Europe in 1955, performing twenty-eight concerts in eleven countries. In 1973, the orchestra became the first from the United States to perform in the People’s Republic of China, one year after President Nixon’s famous visit. The Academy of Music was finished being built in 1857 at 240 S. Broad Street and served as Philadelphia’s first grand opera house. 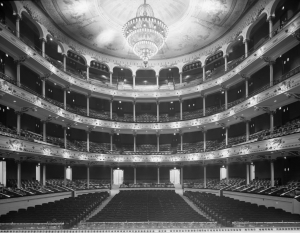 It primarily housed opera performances until the Philadelphia Orchestra’s debut in 1900, and the Academy’s main floor and three balcony levels provide seating for a maximum of 2,509 people. The opulent theater features a sixteen-foot-wide, 5,000-pound chandelier (which took twelve workers about four hours to lower until an electric winch was installed in 1957). The Academy would serve as the home of the Philadelphia Orchestra until the Kimmel Center’s opening in 2001. Founded in 1900, the Philadelphia Orchestra developed into an iconic organization for Philadelphia through its musicianship, commitment to culture and education, and service as a cultural ambassador. The musical tastes and personalities of a series of influential conductors infused the orchestra with a rich history and distinctive sound as it became one of the finest and most renowned orchestras in the world. Philadelphia did not have an orchestra to call its own until late in the nineteenth century, despite a long history of musical performances sponsored at venues such as Musical Fund Hall (opened in 1824) and the Academy of Music (1857). The first step toward creating a Philadelphia-based orchestra came in 1893, when opera conductor Gustav Hinrichs (1850-1942), choral director Henry Gordon Thunder (1865-1958), and composer William Gilchrist (1846-1916, founder and conductor of the city’s Mendelssohn Club) founded the Philadelphia Symphony Society and began producing three amateur concerts a year at the Academy of Music. In 1899, the society hired Fritz Scheel (1852-1907) to conduct not only the three amateur concerts but also two concerts in spring 1900 with professional musicians recruited from around the city. The success of these concerts laid the groundwork for forming the Philadelphia Orchestra. An executive committee led by Henry Whelen Jr. (1848-1907), a well-known patron of music and the arts in Philadelphia, announced a plan to begin the Philadelphia Orchestra with a season of six concerts during 1900-01. While expecting to cover costs through ticket sales, the committee also sought to raise a guarantors’ fund of $10,000 and exceeded that goal by $5,000. Under the baton of Fritz Scheel, the orchestra performed its inaugural concert at the Academy of Music on Friday, November 16, 1900. 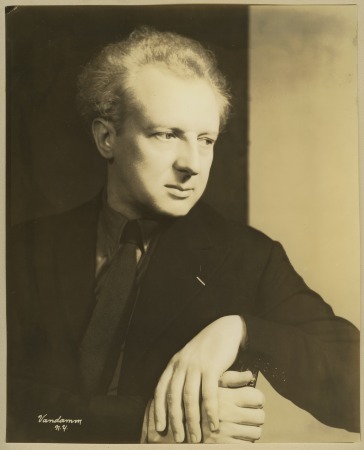 The concert, which received all positive reviews, featured Russian-born Ossip Gabrilowitsch (1878-1936) as piano soloist and a program of European classical music: Carl Goldmark’s Overture In Spring, op. 36, Beethoven’s Symphony No. 5 in C minor, op. 67, Tchaikovsky’s Concerto for Piano No. 1 in B-flat minor, op.23, Carl Maria von Weber’s Invitation to the Dance, op. 65, and Wagner’s “Entry of the Gods in Valhalla,” from Das Rheingold. 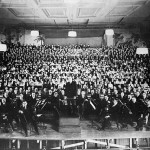 The success of the orchestra’s inaugural season spurred its patrons to create the Philadelphia Orchestra Association, formed on May 17, 1901, and consisting of officers, a board of directors, and executive committee. Scheel became the orchestra’s first official music director and conductor, and he realized almost immediately that the orchestra could not be sustained by local concerts alone. In the first year the musicians traveled only within the immediate region in Pennsylvania and New Jersey, but in the second season, despite a large deficit, the orchestra managed to travel to New York, Baltimore, and Washington. Scheel’s term as conductor and musical director spanned the early challenges, financial difficulties, and successes of the orchestra, and his legacy laid the foundation for his successors. Scheel searched for and hired the finest musicians, invited well-known guest artists, and performed works by the great European masters as well as lesser-known composers. 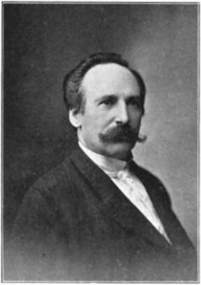 His death on March 13, 1907—from pneumonia contributed by nervous exhaustion—was mourned as a great personal loss to the orchestra and to Philadelphia. 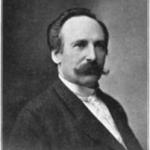 Bohemian-born Karl Pohlig (1864-1928) succeeded Scheel and enlarged the orchestra from sixty-five players to eighty. He expanded the orchestra’s repertoire and invited the Russian composer Sergei Rachmaninoff (1873-1943) to guest conduct in 1909. However, orchestra musicians found him abrasive, and a soloist described his conducting as “uninspired.” Pohlig’s tenure ended abruptly with the revelation of an extra-marital affair with his secretary. Stokowski and the orchestra further enhanced the orchestra’s reputation by making recordings for more than thirty years with Camden’s Victor Talking Machine Company and RCA. Stokowski’s legacy also included children’s concerts, which began in 1921 for children ages twelve and under and evolved in 1933 into a series of hugely successful youth concerts. Moreover, Stokowski’s attraction to film had opportunities for an even wider audience. 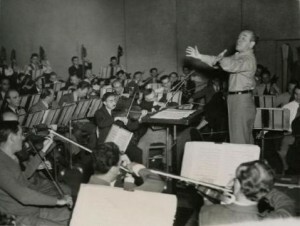 Stokowski inspired Walt Disney (1901-66) to create the full-length animated film, Fantasia in 1940, which featured classical music and the Philadelphia Orchestra. The film was successful but did not lead to additional collaborations. The Philadelphia Sound continued under the baton of its fourth music director, Eugene Ormandy (1899-1985), who held the position for more than four decades. Between 1940 and 1970, Ormandy enhanced the Philadelphia Sound by purchasing the finest string instruments by makers such as Stradivari and Guarneri. The instruments, combined with the extraordinary talent of the string players, further established the Philadelphia Orchestra’s reputation as the finest in the world. The musicians’ many travels with Ormandy included a 1949 tour of Great Britain, the orchestra’s first tour of continental Europe in 1955, performing twenty-eight concerts in eleven countries, and in 1973, a tour to the People’s Republic of China, a first for an American orchestra. Along with musical successes, Ormandy and the music directors who followed him in the late twentieth and early twenty-first century faced numerous institutional challenges, including labor relations with musicians. Strikes or threats of strikes by members of the orchestra centered on wages, pensions, health care, and parity of salaries with other orchestras. The first major strike by the musicians’ union—the Philadelphia Musical Society, Local 77, of the American Federation of Musicians—occurred in 1966 during Ormandy’s tenure and lasted fifty-eight days. The second, in 1996, was caused by several factors and lasted sixty-four days. 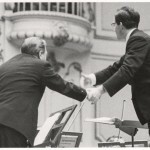 The orchestra musicians blamed the management for the delay in the building of a new concert hall, for a three-year deficit that led to pay and healthcare concessions to balance the budget, and more importantly, the loss of a recording contract with EMI, which had expired in August 1996. While under a recording contract, the musicians were guaranteed a minimum sum above their salary through broadcasting and recording fees. Musicians feared the loss of the contract would not only erode the orchestra’s national media exposure, but also would prevent the orchestra from attracting first-rate musicians and diminish its reputation as one of the best orchestras in the world. While Ormandy continued the orchestra’s lush sound and standard nineteenth-century repertoire, his successors instituted many changes. The next music director, Riccardo Muti (b. 1941), who led the orchestra from 1980 to 1992, programmed a range of music from Haydn to Penderecki and introduced a leaner sound, criticized by many. Wolfgang Sawallisch (1923-2013), who followed in 1993, brought back the Philadelphia Sound and favored works by Mozart, Haydn, Beethoven, Schumann, Bruckner, Dvorak, Brahms, Wagner, and Strauss. He also introduced more American music and modern works. As senior musicians retired, Sawallisch reshaped the orchestra by replacing more than a third of the players. 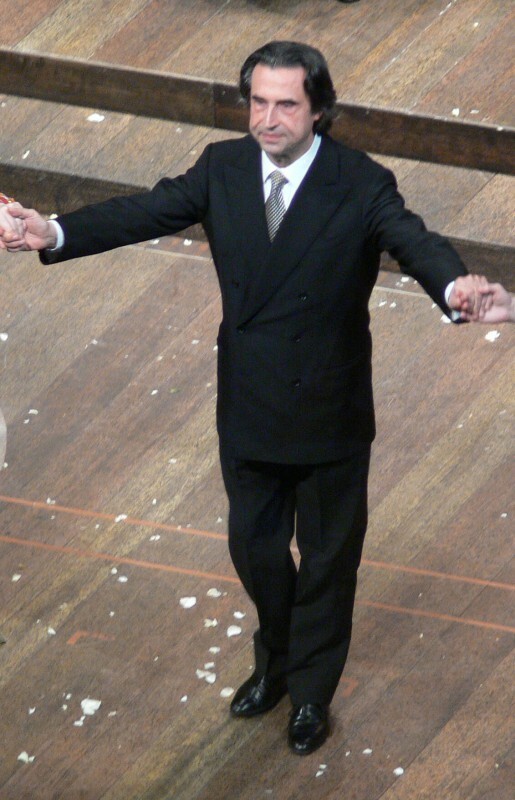 His successor, Christoph Eschenbach (b. 1940), increased community outreach and regularly performed chamber music with members of the orchestra as a pianist. However, in 2008 he announced his tenure with the orchestra would end amid negative comments in the press in Philadelphia, which arose partly from orchestra members unhappy about the initial hiring process of Eschenbach and later by his style as a leader. The most significant change for the orchestra during this period was its move to a new home, the Kimmel Center for the Performing Arts, where Sawallisch conducted the inaugural concert in Verizon Hall on Saturday, December 15, 2001. The program consisted of Kernis’ Color Wheel, Ravel’s Daphis et Chloé, and Beethoven’s Triple Concerto in C Major, Op. 56, with performances by Emanuel Ax (b. 1949), Itzhak Perlman (b. 1945), and Yo-Yo Ma (b. 1955). Verizon Hall proved to be different acoustically from the Academy of Music. Its vastness produced a more brilliant sound, and for the first time players could hear each orchestra section clearly. As a consequence, the performers had to learn how to blend and play differently. The orchestra also made changes to attract new audiences. Some were minor, such as giving up the formal wear “uniform” worn by the players and having the orchestra stand up and acknowledge the audience. In an attempt to fill the hall and persuade more people to give the orchestra a chance, inexpensive tickets were made available one half hour before concert time and students of the Curtis Institute of Music were admitted free just as a concert was about to begin. The orchestra also began outdoor performances in neighborhoods throughout the city. Other, more major, adjustments included adding visuals in the form of slides, dancers, dramatic readings, and even circus acts to accompany familiar and unfamiliar music. The orchestra also continued to play in venues such as the Mann Center for the Performing Arts and Saratoga (N.Y.) Performing Arts Center to attract audiences who were generally non-concert goers. During this period of turmoil and change, Yannick Nézet-Séguin (b. 1975), a Canadian born prize-winning pianist and conductor, emerged as the next music director following an interim of four years in which Charles Dutoit (b. 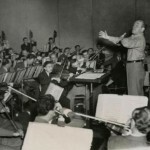 1936) became chief conductor. Nézet-Séguin debuted as guest conductor in December 2008, became music director-designate in June 2010, and then music director in 2012. In January 2015, the orchestra extended Nézet-Séguin’s contract to the 2021-22 season. 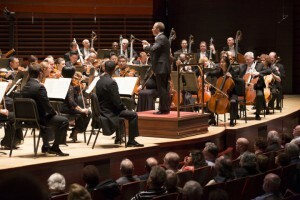 Nézet-Séguin’s ascent to the podium occurred as the Philadelphia Orchestra Association declared and emerged from bankruptcy. The financial woes that led to the 2011 declaration of bankruptcy—the first for an American orchestra—included the high cost of musicians’ pensions and financial obligations to Grammy-winning pianist and Philly Pops artistic director Peter Nero (b. 1934). The orchestra also faced renegotiating agreements with the owners of the Kimmel Center and a new collective bargaining agreement with musicians. The Orchestra Association came out of bankruptcy in June 2013, but not without deep concessions by its musicians. Rising above the fray of the bankruptcy turmoil, Nézet-Séguin focused his energy on music and audiences, including some risk-taking in programming by introducing more Baroque music, more vocal music, and more contemporary American composers. 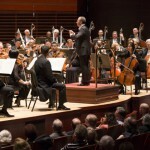 Nézet-Séguin’s youthful exuberance and musicianship opened a new era of seeking larger audiences and while continuing the legacy of the Philadelphia Orchestra. Joseph C. Schiavo is a Clinical Associate Professor of Music and the Associate Dean for Undergraduate Programs and University College in the Faculty of Arts and Sciences at Rutgers University–Camden. Ardoin, John. The Philadelphia Orchestra: A Century of Music. Philadelphia: Temple University Press, 1999. Peralta, Phyllis W. Philadelphia Maestros Ormandy, Muti, Sawallisch. Philadelphia: Temple University Press, 2006. Seltzer, George. 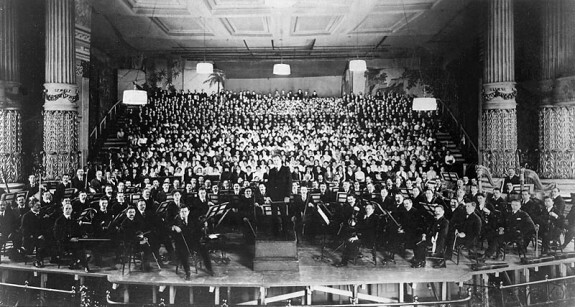 The Professional Symphony Orchestra in the United States. Metuchen, N.J.: Scarecrow Press, 1975. Wister, Frances Anne. 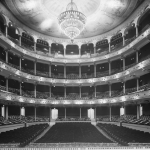 Twenty-five Years of the Philadelphia Orchestra, 1900-1925. Philadelphia: Published under the Auspices of the Women’s Committees for the Philadelphia Orchestra, 1925. Philadelphia Musical Association Papers, Historical Society of Pennsylvania, 1300 Locust Street, Philadelphia. Eugene Ormandy Papers, Oral Histories Collection, and Family Home Movies Collection; Leopold Stokowski Papers and Collection of Sound Recordings, University of Pennsylvania Rare Book and Manuscript Library, Van Pelt-Dietrich Library Center, 3420 Walnut Street, Philadelphia. Otto E. Albrecht Music Library, Van Pelt-Dietrich Library Center, 3420 Walnut Street, Philadelphia. 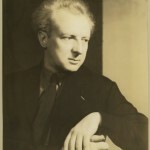 Leopold Stokowski Collection, University of Maryland Libraries, College Park, Md. Musical Fund Hall, 802-10 Locust Street, Philadelphia. The Academy of Music, 240 S. Broad Street, Philadelphia. Kimmel Center for the Performing Arts, 300 S. Broad Street, Philadelphia. Excellent highlights reel! Well done.